One of many series to which the Duck was quite a latecomer was Crash Bandicoot. Being very determined to catch up on as many classic series as possible, I was able to finally play this delightful PS1 platformer thanks to the release of the N. Sane Trilogy on the PlayStation 4 (click here to watch me play the game on our Youtube channel). I’m a big fan of platformers, especially those from the 90’s, so it was no surprise that the first game was a pleasure (as of writing this, I have yet to play the other two games in the trilogy). Most of the time. As with all difficult platformers, however, there are some particularly gnarly levels which I did not find fun in any way whatsoever. Below we shall be discussing…the top five most annoying levels from the original Crash Bandicoot! 5 – Native Fortress: The first level that really gave me trouble was Native Fortress, believe it or not, which took me a full hour to complete. Starting out, I had trouble with the simple act of traversing from one bouncy, metal crate to the next. (Though this was a skill I had to develop quite extensively later on in the game.) And even once I had mastered that nonsense, I found myself ill-prepared for what came next. The final stretch of the level involved no shortage of tricky jumps, all the while avoiding spiky logs and flaming torches! Yikes! 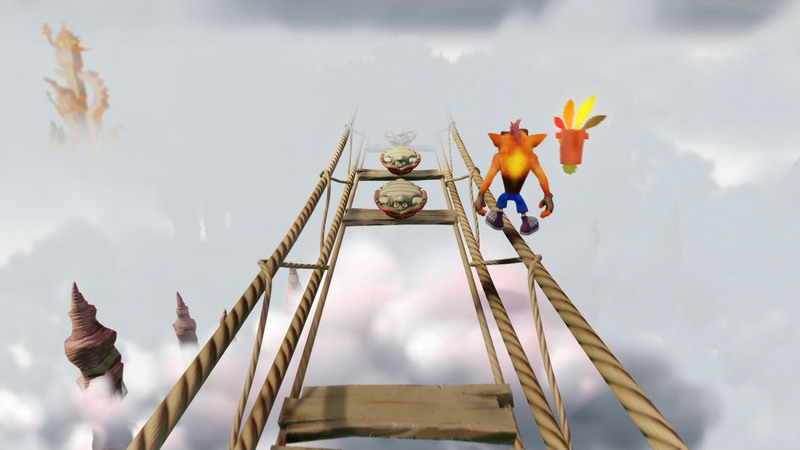 3 – The High Road: It was thanks to a post written by Hatm0nster some time back that the Duck was made aware of a particularly wicked level in the original Crash Bandicoot, The High Road. If you thought the Road to Nowhere was bad, just wait until you play through this stage and learn the true meaning of pain. This level has no right to be called a road of any kind, for this mysterious rope bridge in the sky is more open space than solid footing. To cross these exceedingly wide gaps, you have to navigate a good deal of the bridge by bouncing on turtle shells, which is not my strong suit. If I didn’t decide to cheat and just walk along the rope, I may have never finished this stage at all. Hey, don’t judge me! 2 – Fumbling in the Dark: The only good thing about this level is the fact that it’s optional. 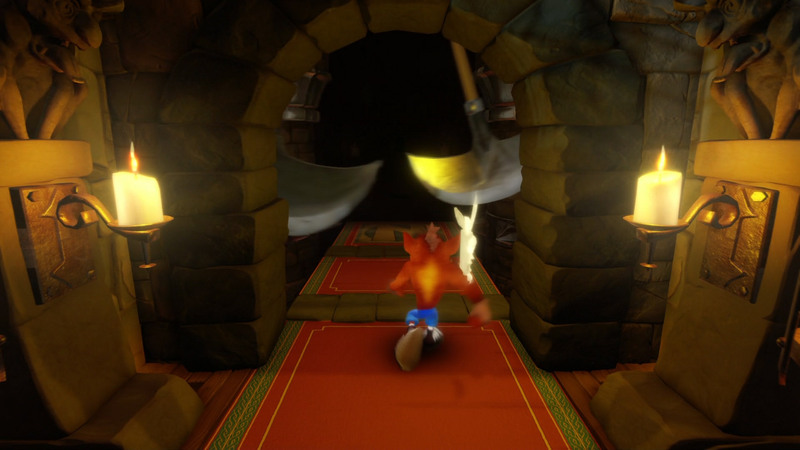 Similar to Lights Out, you need to move quickly through the dark corridors of Dr. Cortex’s castle before the light from Aku Aku goes out. All the while, you have to deal with bottomless pits, moving platforms, and plentiful swinging axes. Worse yet, you lose your light source if you take any damage, which proves fatal quite quickly because, trust me, you can’t see…anything! Fumbling indeed! 1 – Slippery Climb: Also mentioned in Hatm0nster’s post was Slippery Climb, a level that comes directly after The High Road. Feeling confident after my most recent victory, I had high hopes that this level wouldn’t give me too much trouble. I was wrong. Really, really wrong. Instead, I spent about 1 hour and 45 minutes repeatedly dying thanks to some pretty awful moving platforms and stairs that like to flatten themselves into ramps. I think what got to me most was how rare checkpoints were, not to mention a particular set of platforms about halfway through whose timing was horribly out of whack. Of course, no worries. Several deaths later, and they were back in sync. Like any good platformer, Crash Bandicoot was sufficiently rage-inducing from time to time, but no stage was able to best the Duck forever. What about you, dear readers? Why not share your worst Crash Bandicoot levels in the comments below! Next Post Are We All Ready for Uncharted: The Movie? I just played through the remastered trilogy, and I agree with the list. I just would not put Fumbling in the Dark so high, because the first three gave much more trouble than it. In fact, I would put the High Road at the top, because, just like you, if I had not gone online and learned about the rope-walking trick, I would not have finished the game at all. That’s true; the High Road would have been pretty much impossible if I hadn’t cheated through it. I have to wonder if the ability to walk on the rope was on purpose, as Naughty Dog knew their level was ridiculously difficult, or if it was a happy accident. Well, either way I am thankful for the gift they gave us!